"You have no new Karma comments"
I've constantly seen this message at the top of the forum screen, and idly wondered why I've not been getting any Karma, despite some kind comments on my posts. I just happened to take a look in my control panel to find that I have got recent Karma (thank's guys). So what gives with the "You have no new Karma comments" message? Why aren't I being notified that I've been given comments? And come to think of it, how recent is "recent"? Re: "You have no new Karma comments"
I think it displays the "new" number until you leave and come back. Similar to "new posts". Might be wrong though. Hmm.. I've reset my password recently, so that forced a log-out. Never mind. I'll just get into the habit of checking manually every so often..
Once you've looked at your Control Panel once, you've viewed your karma details, so technically it means no new karma since the last time you visited your control panel. You're most recent karma before now was on 4/17. Hmmm.. 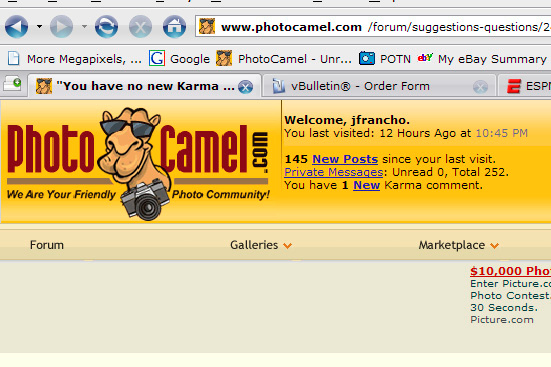 So when I just opening up PhotoCamel just now, I get this (once I go into my control panel after seeing (to the left of my posts) that my Karma's jumped up to 4 . So. No notification of new Karma. Not that it's a complaint, but it would be nice to know if I had some new Karma when I visit. If you go straight to your CP, then no, you won't get a notice. But if you go to the forum main page you should. If not, perhaps clearing the cache out might help? Once I looked at it, I can see that I received a Karma from hypordk for passing along a link to Mike's Framer script. Planning on starting your own Forum, JF? Probably just me then. I'll keep my beady eye on it. Uhhh, no? What do you mean?